Brave Frontier – my newest free-to-play obsession. Same formula as many other “collectible card games” – you collect units or various rarity, level them up and evolve them, form squads and go off to battle. So what makes this different from any of the other games that I play? Why does it hold my interest? It’s the graphics and the style! It’s Japanese-based, so the characters are anime. These are not collectible “cards”, but units represented by artwork and animated sprites, complete with their own animations and powers. With music and animations, it really does feel more like a game rather than a “collectible browser and database”. It’s still a collectible, by-the-numbers, mobile game at its core. Players form a squad of up to 5 units, made up of units captured through their travels. A 6th position is for your friend’s leader, which you can select from a list of friends before each battle. The leader unit and friend’s leader provides a bonus to the team. Units level up and improve by consuming other units through a process called “fusion”. Once the unit has peaked, it can evolve to the next tier, provided that the player has the required materials for evolution (which are other units). Battle is conducted like the classic Japanese role-playing games (JRPG), where one side goes, then the other. 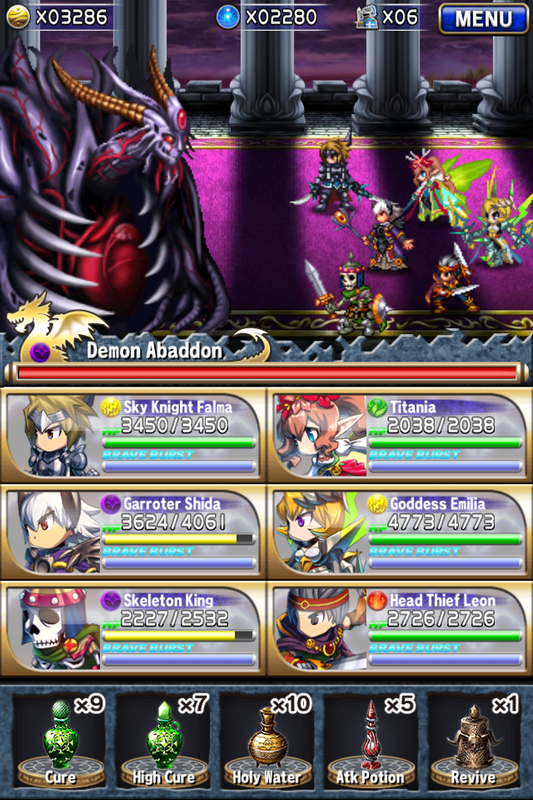 The player will select which unit will attack and which target to attack, by tapping. Units also have the option to guard, giving up their attack to reduce incoming damage. Units that have filled up their “Brave Burst” gauge and swipe and perform their special “Brave Burst” attack, which can heal the party, buff the party, inflict status ailments on the enemy, or attack all enemies at once. The player can also expend potions to heal, remove status ailments, or buff party member(s). During the course of battle, enemies will drop materials that can be used to create potions and weapons. Defeated enemies have a chance to be captured or drop more resources. Each battle consists of multiple rounds, that lead to a final round against a boss (or bosses). Once the boss is defeated, the player can finally collect all the resources collected throughout the battle, including captured units. Defeat along the way is a game over, unless the player expends a premium resource, a Gem, to revive and continue the battle. The player will also receive experience points that level up the player profile. When a player levels up, energy levels are increased, the friend cap is raised, and the player can also field more costly squads. More importantly, the energy gauge is refilled. While the turn-based combat may seem in-depth, there is still plenty of grinding and when you have powerful units, battles do become monotonous tapping (with the occasional heal or potion-chugging). However, like action-RPGs, such as Diablo, I keep doing it because there’s that chance for a rare drop/capture! Energy is the “time restricting” mechanic. It takes a 10 minutes to regain a single point of energy, and going on quests can cost anywhere from 3 energy to 30! Obviously a Gem can refill the energy gauge instantly. For me, it allows me to play in short sessions befitting my schedule. However, some events require scheduling around (but that is no more, since they changed how “Metal Parades” work). PvP is done through the Arena, and the player has absolutely no control. The player is paired against another and watch the AI duke it out, cursing when units don’t use their Brave Burst or ignore enemy units with single-digit HP. Arena points are earned with victories, which come with rewards (weapons, armor, Gems) at certain tiers. Losing in arena deducts Arena points. In addition to capturing units in battle, most of these units can be instantly summoned by expending Honor points. Honor points are earned when a player calls on a friend to battle, and when friends call on the player’s leader. Honor points can also be gifted. The units summoned through Honor are of common and uncommon rarity (1-star and 2-star), and random. “Rare Summon” will give the player a random unit of 3-star or better rarity, and this is the only way to obtain such units in-game as they cannot be captured in battle (but are strong to fight against). Rare Summon requires 5 Gems, which is the equivalent of $3.99 USD ($0.99 per Gem, or $3.99 for a 5-pack). Brave Frontier has exploded in popularity, so much that the game has gone through a lot of growing pains. Servers were crashing under heavy loads, they expanded the player ID length from 8 digits to 10 to support the growing number of players across the globe. They reworked their events scheduling to reduce load (imagine first-come-first-serve when a one-hour window opens for thousands of players). 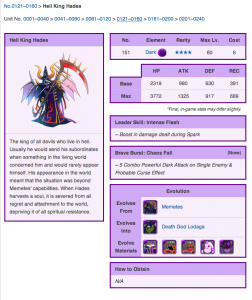 The Brave Frontier team has been very communicative and responsive to its player base, and players have been fairly compensated, in my opinion. While the Japanese fantasy influence plays a large part of why I like the game, getting involved outside of the game also keeps my interest going. They have a very active Facebook page, running various events and contests (which I have participated in). 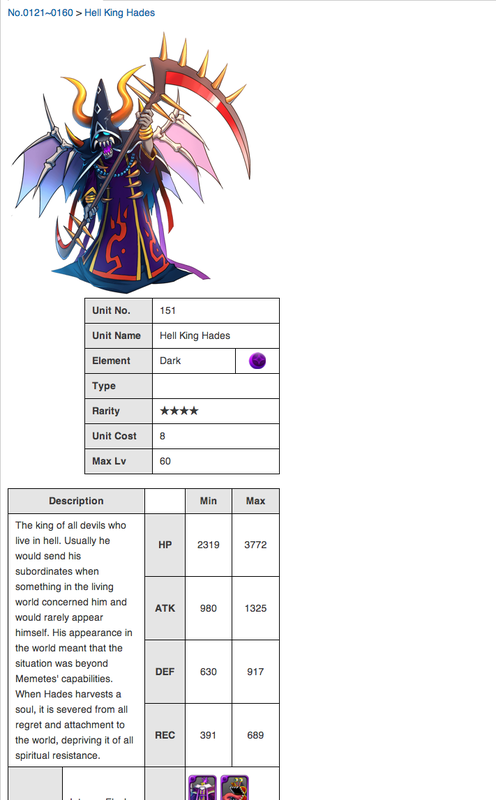 There is also an official wiki, which is actually just hosted by Wikia. 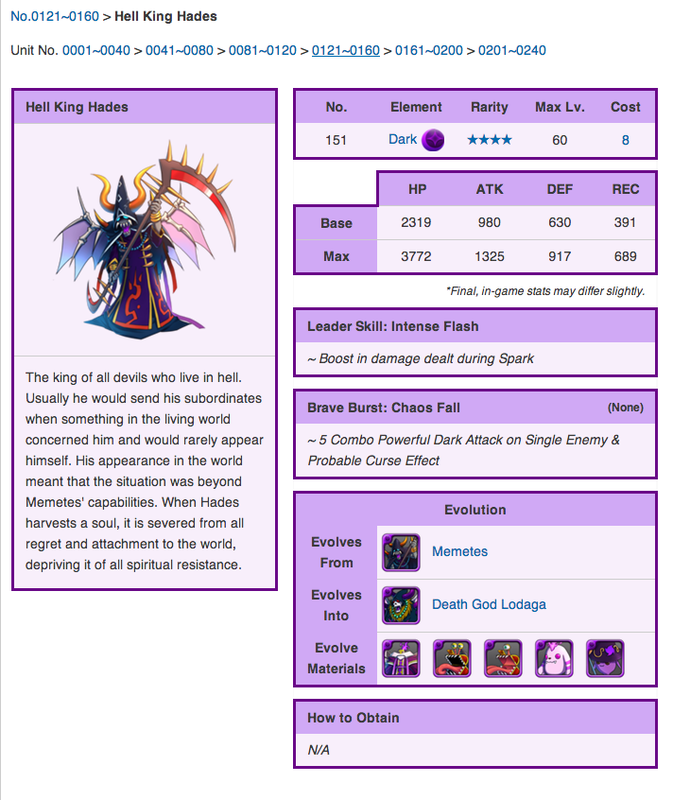 I have been a very active contributor… updating their templates, which in turns updates the overall look of the wiki. Just look at my handiwork! If readers decide to try this game out, remember to use my player ID as a referral – we both will get a Metal God unit (great for fusing and leveling other units!) These guys are as elusive as the Dragon Quest saga’s metal slime family (and probably the influence for Brave Frontier’s metal units).